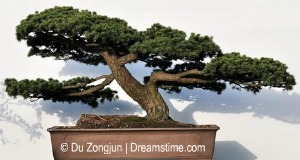 There are several different types of bonsai trees, and the ones you choose will depend on where you live, the space you have to work with, and the style or vision you have for your masterpiece. If you live in a colder climate or an area with harsh winters, it may be best for you to grow a tree that is suited for the indoors. If you are located in a tropical climate, you may want to avoid northern species that are used to dormant periods and seasonal changes. Some types of bonsai trees can adapt to a variety of conditions, while others are very sensitive, so it is important that you investigate the needs of each option before making a purchase. There are many types of trees that are suited to bonsai, and new ones are always being introduced. If you are a beginner, it is probably best to start with one of the more common species that are easy to work with and train. However, the styles and forms can reflect the unique expressions of the artist, so you are really only limited by your imagination. Just because a particular type of tree has not been used before does not mean that it would not make an ideal bonsai choice. Although there are popular species that are frequently used, bonsai societies always welcome new ideas. Basically, bonsai trees are divided into two categories: indoor and outdoor. Those species best suited for the indoors do not handle the elements well and must be kept in an environment where they are protected from harsh weather conditions. Other types of bonsai trees are quite hardy and are ideal for outdoor bonsai, often allowing for larger varieties and bigger shapes. Indoor bonsai is typically more difficult to care for, so it is important that you choose a tree that will be comfortable in your home environment. Houseplants are a great choice for bonsai, but if you wish to use a more traditional tree, try to find one that has similar care instructions to other thriving plants in your house. Or, be prepared to change the climatic conditions of your home to make it more suitable. Tropical or subtropical trees are the best choice since they are the easiest to grow indoors. Some good options would include Hawaiian umbrella tree, Sago Palms, Serissa, Fulkien Tea, Schefflera, Aralias, Money Trees, Brush Cherry, Bougainvillea, Gardenias, Ficus, Baby Jade, Cotoneaster, and some types of elms. Outdoor bonsai is divided into two categories – coniferous (evergreen) or deciduous. Coniferous trees are a common choice since they keep their foliage all year round. Perhaps the most popular and well-known bonsai is the juniper, which is very hardy and easy to grow. Other examples would include pine tree varieties, boxwood, and azaleas. Deciduous trees will lose their leaves in the fall and enter a dormant period. Some artists enjoy this feature, with the bare branches of winter offering a stark contrast to the lush spring or summer flowers and foliage. Some ideal deciduous choices include maples, elms, gingko, larch, crab apple, hornbeam, and bald cypress. While the climatic conditions are a factor, you must also consider the style or form you desire when choosing a bonsai tree. Some styles can be created with a variety of species, while others work best with specific types of bonsai trees and plants. In this form, the trunk is perfectly straight and upright with a good taper. Branches begin about 1/3 of the way up the trunk and are evenly spaced, starting with the longest and thickest at the bottom and continuing to the shortest and thinnest at the tip. The ideal informal upright will be symmetrical and triangular, replicating a tree that has experienced an even exposure to elements and no competition from other trees or objects. This form is one of the most difficult bonsai styles to achieve. This is the most common bonsai style, and unlike its formal counterpart, is also one of the easiest forms to create. Most species are well-suited to informal upright shaping, making it a great choice for beginners. In this style, the trunk will curve or change directions, but will tend to straighten out towards the tip. It will still maintain its typical triangular shape, with the larger branches at the bottom and the smaller ones at the top. This style replicates a tree that has faced competing forces or obstacles throughout its life such as buildings, fences, or other trees. This style typically has a straight trunk, although a few curves may be present, and slants at an angle ranging between 10-45 degrees. This form depicts a tree that has experienced uni-directional elements such as wind or snow, or is planted in the shade and must lean toward the sun. In this style the trunk is straight and upright with symmetrical branches that begin about 1/3 of the way up and radiate out from the trunk to form a rounded ball-shaped crown. Due to the specific shaping, this style is best suited to deciduous trees. Basically, the broom form mimics a tree that has grown in perfect conditions with no competition or extreme elements. To create a cascade bonsai the trunk or main branch is bent over, sometimes lower than the bottom of the pot, with branches flowing downward. It is designed to replicate a tree that has grown on the side of a cliff or over water and has been forced to reach toward the ground due to environmental conditions. Semi-cascade and Multi-trunk cascade are popular variations of this bonsai style. This style portrays a tree that has developed in an area with strong, uni-directional winds, causing the trunk to grow on an angle and all the branches to permanently bend in the same direction. The windswept form can be applied to a number of other styles such as the upright or cascade. This form is characterized by a tall, slender, crooked trunk with branches and foliage beginning very high up. The style depicts a tree that has faced much competition and has struggled to reach light by growing taller than surrounding trees. There are several designs within this category. The twin trunk form is two upright trunks that split at the base but are connected by a common root system. Typically, one trunk is thinner and grows at an angle when compared to the other trunk. The raft form replicates a tree which has fallen to the ground and the upward pointing branches grow into a line of trees connected to the original trunk and its root system. The multiple trunk types of bonsai trees consist of three or more odd numbered trunks with varying heights and thickness, all growing from the same root base. This style depicts a forest, and includes multiple trees, all with their own root systems. Typically, the tallest are planted in the middle with decreasing heights moving outward to keep with the characteristic “triangular” shape. In some cases, the taller trees are planted at the front and the smaller ones at the back to give the impression of peering into a forest, with the closer objects being larger. This bonsai is designed to represent trees that grow on rocky ground with the roots crawling over a rock and into the surrounding soil. Sometimes the roots will grow into cracks or holes, and this form is known as “clinging to a rock”. In this style, the roots look like an extension of the trunk and will sit on top of the ground or grow across the terrain. By choosing the right types of bonsai trees for your environment and vision, you can create a work of art that is both unique and eye-catching, and will give you years of pleasure.